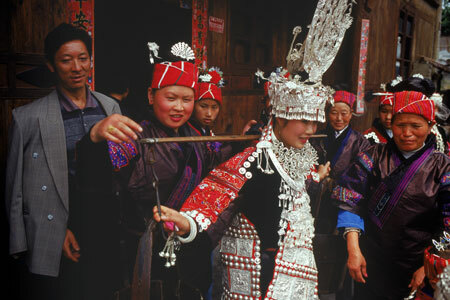 A Miao wedding is always a great event. The whole village is participating in the celebration; everyone is welcomed as a guest. Early in the morning, this bride is ready, being prepared to her best. Traditional ceremonies are performed; here the bride is carrying a set of water buckets filled with water, implying the hope of coming wealth.